Selective pressures imposed by herbivores are often positively correlated with investments that plants make in defense. Research based on the framework of an evolutionary arms race has improved our understanding of why the amount and types of defenses differ between plant species. However, plant species are exposed to different selective pressures during the life of a leaf, such that expanding leaves suffer more damage from herbivores and pathogens than mature leaves. We hypothesize that this differential selective pressure may result in contrasting quantitative and qualitative defense investment in plants exposed to natural selective pressures in the field. To characterize shifts in chemical defenses, we chose six species of Inga, a speciose Neotropical tree genus. Focal species represent diverse chemical, morphological, and developmental defense traits and were collected from a single site in the Amazonian rainforest. Chemical defenses were measured gravimetrically and by characterizing the metabolome of expanding and mature leaves. Quantitative investment in phenolics plus saponins, the major classes of chemical defenses identified in Inga, was greater for expanding than mature leaves (46% and 24% of dry weight, respectively). This supports the theory that, because expanding leaves are under greater selective pressure from herbivores, they rely more upon chemical defense as an antiherbivore strategy than do mature leaves. Qualitatively, mature and expanding leaves were distinct and mature leaves contained more total and unique metabolites. Intraspecific variation was greater for mature leaves than expanding leaves, suggesting that leaf development is canalized. 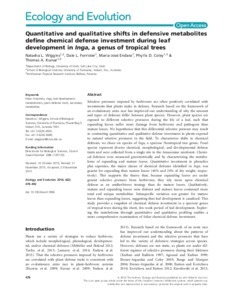 This study provides a snapshot of chemical defense investment in a speciose genus of tropical trees during the short, few-week period of leaf development. Exploring the metabolome through quantitative and qualitative profiling enables a more comprehensive examination of foliar chemical defense investment.